The heart of workplace diversity lies with enlightened leadership and a genuine commitment to fairness, rather than numbers-counting to meet legal requirements, or even persuading others that it serves as a competitive advantage. 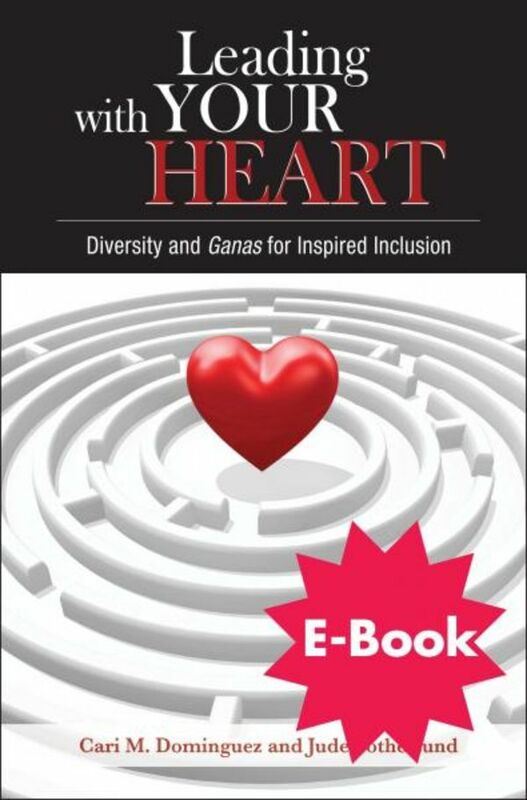 Leading with Your Heart explores inspired leadership across an organization and the use of a positive moral compass to drive a new way of thinking and integrating our nation's rich diversity. Cari Dominguez and Judith Sotherlund use the term "ganas" (gah-nas) to capture this concept. Ganas speaks to one's inner desire to succeed. Motivation drives performance. Inspired motivation drives individuals to connect their day-to-day practices with their guiding beliefs, and to do the right things in the face of obstacles. Leading with Your Heart presents anecdotes of inspired inclusion in the workplace, not necessarily to establish best practices models for replication, but to affirm the lasting values of integrity and fairness that result from leading with the heart. HR professionals will find Leading with Your Heart instrumental in bridging the gap between the idealized expectations of the C-suite and the pressing realities of needing to get the job done at the line manager and local levels. Chapter 7: A Heart Check-up: Have You Hugged Your Policies Lately? Cari M. Dominguez is the owner of Dominguez & Associates, a management consulting firm that provides selective services in the areas of workforce assessments and diversity evaluations. Dominguez serves on several for profit and nonprofit boards and has numerous professional affiliations. Her public service includes being the former Chair of the Equal Employment Opportunity Commission (EEOC), Director of the Office of Federal Contract Compliance Programs (OFCCP), and Department of Labor's Assistant Secretary for the Employment Standards Administration. In the private sector she was a partner and director at two international executive search firms and held a number of senior human resources positions with Bank of America, where she had responsibility for EEO, succession planning, executive compensation, and talent development. Judith (Jude) Sotherlund, president of Sotherlund Consulting, is a corporate consultant and published author. Her public service includes serving as Deputy Assistant Secretary of Labor for Employment Standards and as a Staff Assistant in the Office of Communications at The White House. Private-sector experience includes Vice President of Employment Advisory Services Inc., a senior consultant to the Equal Employment Advisory Council (EEAC), and Director of Communications for the National Committee for Quality Health Care. Perfect Phrases for Motivating and Rewarding Employees 2nd Ed.